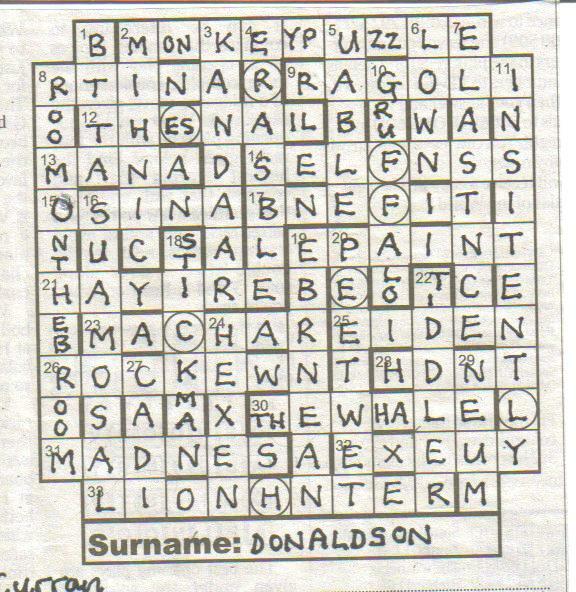 Numpties were travelling again with only pencil and paper (and an iPhone with Bradford and Chambers but no Internet access) I’ve commented before that I truly admire the setters and solvers who can complete a Listener crossword with only pencil and paper. We were fine this time until the end game, when with a full grid and even a name that almost resolved itself from those eight letters, and a sneaking suspicion that a familiar character was appearing at 10d, we were flummoxed. Solving went relatively well from our earliest solutions, ‘Didn’t have hot drinks too regularly (5)’ (H[ot]D[ri]N[ks]T[oo]), ‘It detects light element coated in radium (6)’ (RTINA) establishing Wasp, along the way, as a confirmed member of the Listener tipplers’ club with his preference for cold drinks and ‘Not quite last beer drunk? That’s not permanent (8)’ LAS BEER* giving ERASBLE). We were perhaps lucky in spotting solutions to the longer words. After all, these were generous clues. I am almost relieved when the number of clues is small (only 36 in this case as so many lights were unclued). That seems to mean that the clues will be relatively straightforward as the compiler has to allow his solvers some sort of handle to grasp. The anagrams ‘Gym class tweet confused American bird (8)’ PE + TWEET* giving PEETWET, ‘Cut from stone on wreck somehow (8)’ ON WRECK* giving ROCKEWN, and ‘After big game, one is running north line (10) NORTH LINE* LIONHUNTER almost peopled our grid and we were left with just a few problems. ‘Sloane possibly rebuffed in outskirts of Reigate — crazy (7)’ looked like an anagram with that deceptive ‘crazy’ but we smiled when we realized that the Sloane YAH was being rebuffed and ‘crazy’ was the definition for HAYWIRE (entered as HAYIRE). Even the extra letters, that had now almost completely appeared, were generous. The two Qs and the Z gave the hints we needed and ‘ENTERED WITH A SQUASH AND A SQUEEZE’ rang a memory bell, especially as we had a peculiar unclued light that could spell GUFFAW but seemed far more likely to give us GRUFFALO, a familiar couple of Julia Donaldson titles. We were left with a dilemma. We found the other titles, MONKEY PUZZLE, ROOM ON THE BROOM, STICK MAN, TIDDLER and THE SNAIL AND THE WHALE but the preamble seemed to be telling us that, of those double letters that were clearly needed in sixteen squares, the ultimate (presumably the second) should be entered to anagram to ANT, BAT, ZOOPHILOUS. We did that but it didn’t quite make sense since that left us with only eight letters of SCHEFFLER, the illustrator (Yes, we had some Waterstones‘ help now and had made his name out of RFFECLH and a putative S) but we needed another E.
We had assumed that the instruction to enter the thematic unclued entries ‘with a squash and a squeeze’ meant that, like the other entries, letters were to be squeezed out, but clearly not! In order to produce that extra E in the circle in THE SNAIL AND THE WHALE, we would have to squash and squeeze the extra letters in – so that’s what we did. Is this dilemma going to lead solvers astray (has it led us astray?) and are we in the throes of another KOHb crisis? We’ll find out in three weeks’ time, won’t we! Thank you Wasp for an entertaining work out. This entry was posted on 17 May 2013 at 4:00 pm	and is filed under Solving Blogs. You can follow any responses to this entry through the RSS 2.0 feed. You can leave a response, or trackback from your own site. Jim, same here. Au revoir, all correct status. I did think that the thematic entries were to be entered as per the other entries, with letters missing – but, to be fair, that didn’t really explain the missing “E” for Mr Scheffler (other than my slightly tenuous explanation-to-self that this, too, was treated as per the missing-letter entries). Hey ho. My all-correct went missing with Vera, so at least I’ve not lost that. Still hoping for a good year, but this was a missed opportunity. Likewise. I took the clued entries to be signalling the squash and squeeze required for the books, i.e. omission of letters, and saw the missing ‘e’ from Scheffler as another pointer in that direction. There was that word ‘ultimately’ in the preamble, but those unchecked cells were always likely to be the ‘last’ part of the grid fill, so it was hardly an unambiguous instruction. 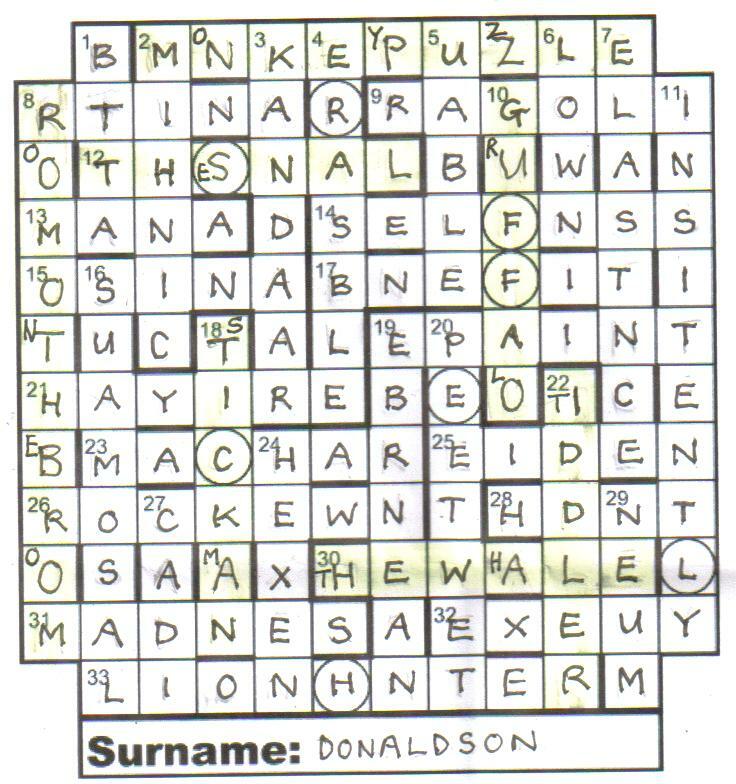 I sympathise with anyone who lost a perfect record here – I think anyone who got the ‘ultimate’ letters in the right cells can claim a moral victory! Can’t really have any grumbles about this. The solution given just looks more correct than mine did. Hey ho indeed.